Emperor Pu-erh is the top loose-leaf Pu-erh tea we offer, people called the tea "Imperial Pu-erh Tea" or "The King of Pu-erh", it consists of tiny, shimmering golden leaf buds, which painstakingly hand-picked from the early spring Pu-erh after it has gone through at least one year's fermentation, making it one of the world's rarest and most difficult teas to produce. 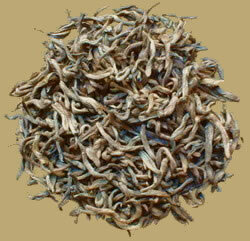 PREPARATION: To prepare Emperor Pu-erh, place approximately 2 tsp. of leaf per serving in a teapot. Rinse by covering with boiling water and quickly pour off. Fill with boiling water again and let steep 5-30 seconds (depending on how light or dark you want the tea) and serve. Emperor Pu-erh tea may be steeped 10-20 times.